Amazon Key Lets Couriers Open You Front Door To Leave A Package | OhGizmo! By Randy Donack on 10/26/17 • Leave a comment! Amazon has gotten really good at this whole delivery thing. With their Prime 2-day shipping, same day shipping in some cities, and their famous $25 order gets free shipping deal, but now they’re trying to make it safer for that new iPad you ordered. 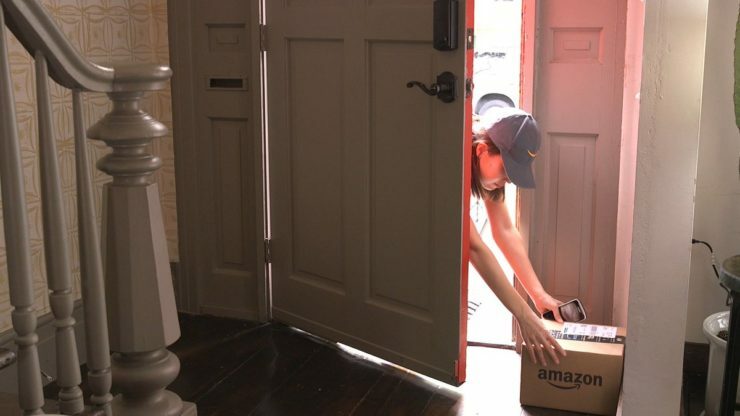 Their new service, Amazon Key, allows users who have both Amazon Cloud Cam and a Smart Lock to opt-in to a program which allows couriers to scan your package and sent the data to Amazon’s servers. If everything checks out, Amazon will unlock the door, allowing them to open it and leave you package inside your house. I don’t know if I want a stranger to have access to my house. He might start cruising around and scope out all my valuables, if I had any, or gawking at pictures of my loved ones, again, if I had any. If you have a lot of trust in Amazon, and want to keep your packages safe, maybe you’re into it. But, next thing you know, the UPS guy is taking longer to finish his routes and comes back rocking a pair of Yeezy’s, a new iPad and a Labrador-Schnauzer named Han Solo.